Do They Know What Patronising Means? All I want for Christmas this year is…another version of Band Aid, another version of the same old stigmatizing ode of guilt and patronizing pity of Sub-Saharan Africa. You probably saw it somewhere in your facebook/twitter-feed or maybe the radio has already started to annoy you with this christmas’s most pathetic carol: Bob Geldorf and his fresh team to save the world (Can “One Direction” members even find Sierra Leone on a map?) have recorded “Do they know it’s Christmas time at all” for a fourth time. And as if the first few versions didn’t do harm enough by setting the whole African continent equal to an Ethiopian famine or the Darfur crisis, this year’s crew decided to apparently use this logo for the release of the 30 year anniversary remake. The haunting image of Bono coming over to fondle me would make me forget about Christmas too. For a great deconstruction of the new lyrics I recommend this piece by the Guardian’s Stuart Jeffries who seems to be equally as confused as myself. 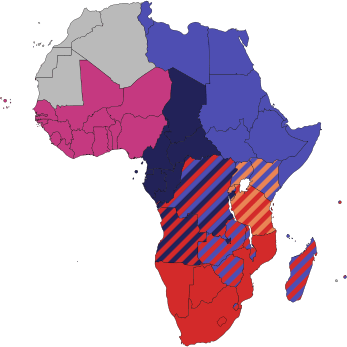 At least Band Aid improved a bit on their geography over the years and sing only about West Africa this time – even though the guy writing the lyrics must have forgotten to tell the bloke making the logo. On top of that, Nigerians, Malians or Burkinese must be pretty surprised that Bob Geldorf and his gang just expressed their condolences for their lack of joy and fun during this festive season. Other West Africans who prefer the mosque over church might actually really not care about Christmas this year, but I’d say that’s more a general thing and Ebola cannot be blamed for that. Today I also had to find out that Bobby G is expanding his patronizing humanitarian crusade to other countries and turns it into a franchise. He has flown into Germany and recruited some (formerly) great musicians for a German version of this 2014 ode to joy. I had realized that Max Herre turned into a douche, but wouldn’t have expected it from Campino. I guess it’s time to delete my “Toten Hosen” and “Freundeskreis” albums from my iPod. Campino stated: “It’s less about art, but about the gesture.” I say it’s mostly about you not thinking about the impact of your action. Somehow I thought the world had moved ahead – but I guess it’s time to promote the “Africa For Norway” campaign again. Watching their great video will make you grasp why Bandaid is just ridiculous. However, 2 million+ views on youtube apparently have not been enough. I have always found these charity songs fairly annoying but being in Tanzania for this Band Aid season, I actually got furious. I blame people like Geldorf, Bono and their friends for the fact that friends around here have lost their jobs and many Tanzanians will actually have some more problems than usual around this year’s Christmas time. However, they are not sick of Ebola or die of hunger under the burning African sun, but they lost their income as tour guides, porters or hotel staff because of stupid Westerners cancelling up to 80% of their trips to East Africa. Apparently, they are afraid to catch Ebola thousands of miles away from its source. Yet, now that I think about it – maybe they also fear Bob Geldof’s smeary hands touching them during their Christmas safari. I’m sitting on the front porch of my little house on Themi Hill. 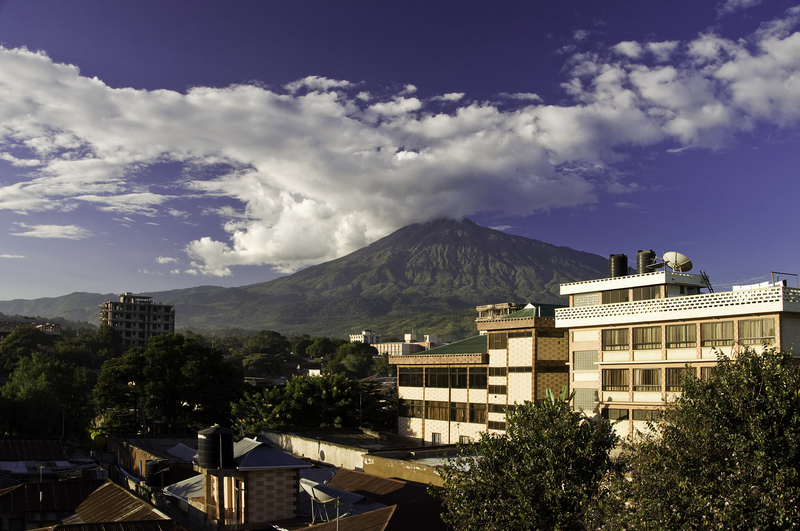 Far in the distance I can see stunning Mt Meru shining above the city – a view I will enjoy for the coming ten months. One week ago I moved to Arusha in northern Tanzania to work for Germany’s state-held development agency “Gesellschaft für Internationale Zusammenarbeit” better known by its acronym GIZ. The local units consults the East African Community during its integration process. A great opportunity to kick-off a career in international development you might think. And yes, you’re right – the project is incredibly promising and already after one week I feel that I will massively profit from this long internship. Nevertheless, even looking at this beautiful scenery spread out in front of me I can’t lose an uneasy feeling deep inside of me. Right after high-school, I decided to do some good old volunteering in a children’s home in South Africa for a year. Half-way through our time we had the chance to listen to a representative of the GIZ office in Pretoria (let’s call him Jake) talking about careers in their little club. This was my first contact with the weird world of development. Having so much fun living in South Africa but also being enthralled by the country’s complex history I soaked up everything Jake said. He told us that they need people with ‘degrees in some solid fields’, so I started studying Economics. What timing! The crisis humiliated the discipline and crushed my motivation to go ahead in the field. I looked into alternatives and switched to Maastricht’s lefty-green-alternative Liberal Arts College, the UCM. A great program that I can only recommend to anybody interested in a holistic undergraduate education. This move also signified the beginning of me doubting that I should see Jake as a role-model. I started picking courses outside Economics, studying critical theory, learning about the concept of neo-colonialism and getting to understand that there are some shocking problems in the industry. Many times I heard that everything the West does to ‘help’ the Global South is pure neoliberalism, patriarchal and on average causes more harm than it does good to the partner countries. Now, I’m really up for the ‘practice what you preach’-approach to living your life and usually hate the type of people that were part of the Marxism Society in College only to become an investment banker a few years later. Yet, here I am sitting in Arusha going back to work tomorrow in a field that I have often condemned in my academic papers. GIZ might not be the worst of them all, but already after one week I have had some prejudices confirmed: power struggles with the ministry, end-of-the-year spending spree (Mittelabflussdruck as the Germans call it…) or the expensive workshop that seems to interest only 3 of 30 invited local partners. So why am I here anyway in the Geneva of Africa – as one of the expats called it – if I’m just whining about it? Maybe because I wanted to see for myself, maybe because development cooperation is what I know best and maybe because I simply think that my specific project is obviously an exception. I am convinced that regional integration is in fact a good way forward for East Africa and believe that the GIZ team does a good job of fostering that process. This is probably what everybody in this game thinks about their own work, allowing the bigger picture to vanish quickly as you get sucked into your career. The uneasy feeling hasn’t left me yet and I remain deeply undecided. Am I studying the enemy or turning into a hypocrite that might continue to sit on Themi Hill and pretend to unite East Africa?